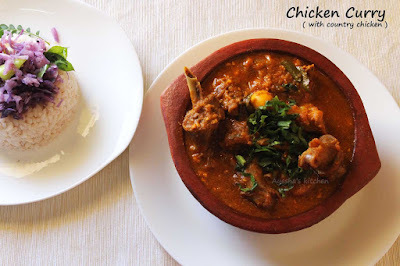 Chicken curry is my favorite curry recipes to serve along with hot steamed rice and ghee rice. This recipe for chicken curry is an authentic country side curry recipe. Here i used country chicken (which is known as nattu kozhi) for making this yummy spicy chicken curry. Since this curry is made with nattu kozhi, it tastes delicious and healthy when compared to any other chicken varieties. The highlight of this curry is , this recipe uses very few ingredients without compromising on taste. The final taste of this dish is simply incomparable. Please be noted that, kashmiri chili powder is used instead of normal red chili powder. As a result, the curry will be less hot but with a fine red color. So if you are using normal red chili powder, do add as per your hot and spice preference. This curry is also called as nattu kozhi kuzhambu / naattu kozhi kulambu / nadan kozhi curry / village style chicken curry / chicken kulambu recipe and like so. 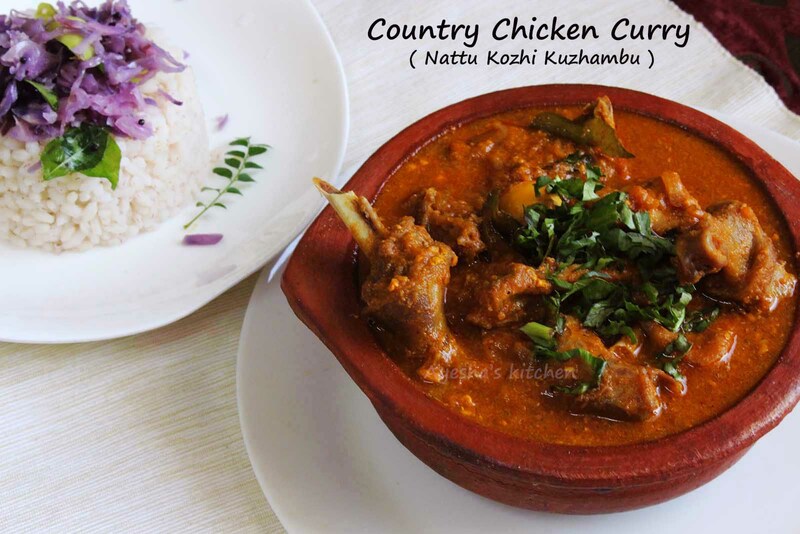 Country chicken / nattu kozhi / house chicken is the term used to refer the chickens which have been raised in the villages . They are raised and fed in natural surroundings and natural feeds. Hence they are more resistance to diseases. Since it is raised in the backyard with natural foods (corn, rice grains, worms) this country chicken is tastier and healthier compared to the commercial chicken (broiler chicken). Here is the recipe showing how to make chicken kuzhambu recipe / recipe chicken curry / simple chicken curry recipe /chicken curry rice /indian chicken recipes /nadan chicken curry /curry chicken recipe /south indian recipes / kerala nadan kozhi curry. Heat a pressure cooker with oil (preferably coconut oil). Saute onion until golden and light. To this add ginger garlic paste and green chilies. Saute until raw smell disappears over a medium flame. When done, add tomatoes chopped and cook until mushy. To this add the spice powders along with salt and mix well. Close the lid of the pressure cooker and cook for 5 whistles(it depends on the age of nattu kozhi ) over a medium flame. When pressure releases, open the lid and add half a cup of hot water (you can add the cooked baby egg now). Combine well and remove from flame once it starts to boil. Heat a pan with a table spoon of oil and fry shallots chopped , curry leaves. Pour this over the prepared curry for seasoning. This is optional but it adds flavor to the curry.